Slightly warmer with around 4 degrees in the morning, but very little evidence of any arrivals. Light easterlies tuirning NW around 11, partly cloudy. Nets open 05.30-13.30. Netmeter hours approx. 2500. Ringed: Eurasian Wryneck 1 (first this season), White Wagtail 1, European Robin 1, Common Blackbird 2, Chiffchaff 1, Common Linnet 3, Lesser Redpoll 2. Total = 11. Also 4 controls. 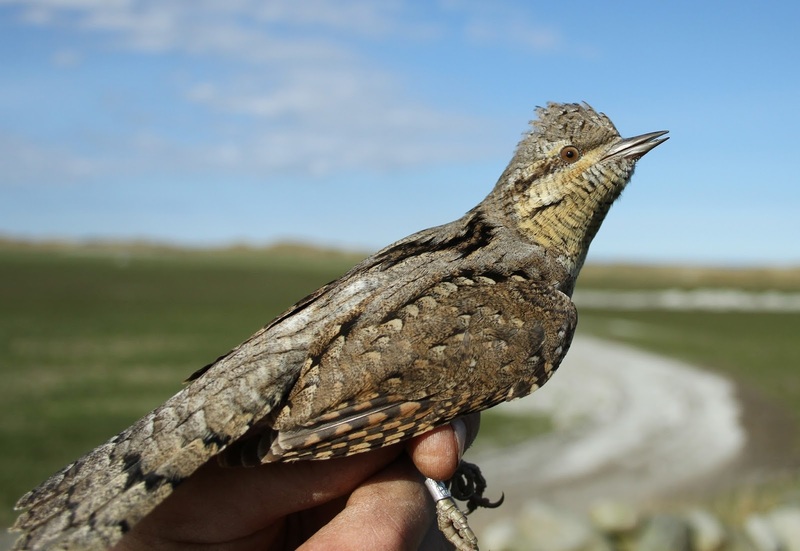 Eurasian Wryneck is a scarce migrant at Revtangen BO, typically we catch one around this time most years. Vendehals. Ringmerket: Vendehals 1, linerle 1, rødstrupe 1, svarttrost 2, gransanger 1, tornirisk 3, brunsisik 2. Total = 11. Også 4 kontroller.